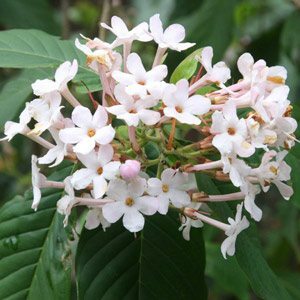 If you are looking for a winter flowering tree, Luculia gratissima is one with the lot, masses of pink flowers, fragrant and easy to prune. In fact you can cut it back hard if you wish with little worry. The flowers are magnificent, as winter sets in you can see the flower heads forming, a promise of a great display of pink from mid winter on. Fragrance as well. However if you are looking for a ‘great foliage plant’ this is not it. The foliage does get a little untidy, we are not concerned, we grow it for the flowers. We have been asked how hard it can be pruned, the answer is ‘very hard’. During a home renovation adventure our Luculia gratissima was damaged, we cut it back to almost a stump. Seven years later it is looking great, and at the time of writing about to burst into flower again. Like all Luculias, this one does not like frosts, however in Australia this is not a big problem in many areas. It is a tree that likes a good sheltered position. A cool moist root run and a well drained soil.